I cannot tell you the number of times I've tried snagging a reservation at Urban Farmer only to find out I'm too late and it's sold out. I made it my mission to try them one way or another. My opportunity finally arrived. 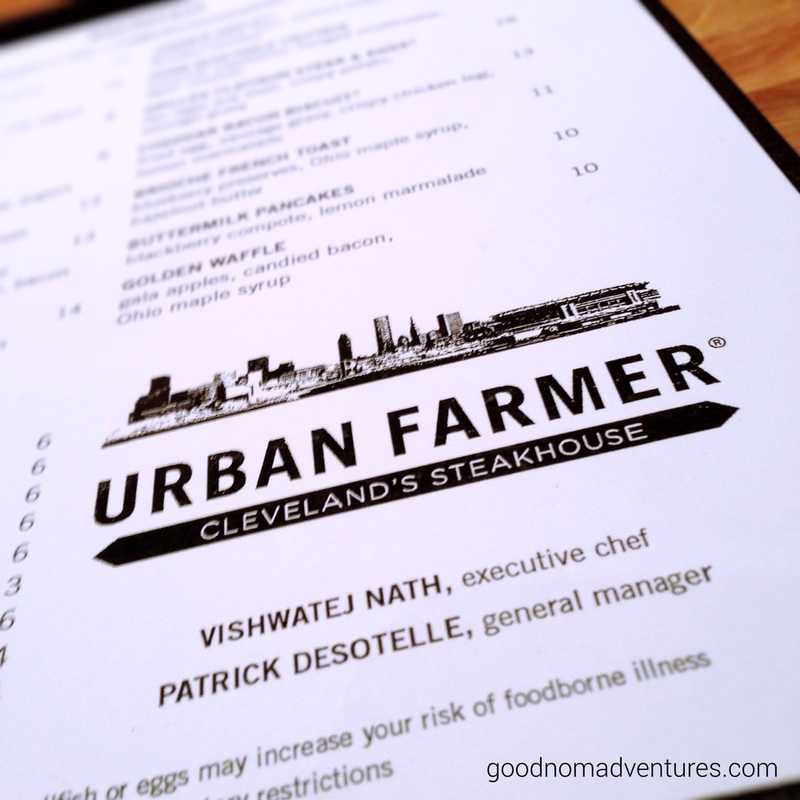 Urban Farmer is located in the lobby of the Westin hotel in Downtown Cleveland and I just happened to be staying there. I booked my reservation at opentable.com and counted down the days. Although they are known for steaks, don't be mislead. Urban Farmer is one place you should have your breakfast or brunch short list. With a simple menu filled with simple fresh ingredients you're going to walk out very satiated. I ordered the Golden Waffle. On the surface pretty simple, almost plain Jane. Truly, don't let looks deceive you. The waffle was fluffy, moist and soft. Just what I was looking for. What sparked my interest were the toppings -- and thinking about it just now makes me want breakfast for dinner. For starters there was the gala Apple "jam" in the center. It was thicker than applesauce and had a great mild sweet flavor. Sweet without being too sweet and very tender. But the yummy goodness didn't stop there. The candied bacon - I mean it's bacon, but then it's candied! It was smokey and sweet and perfect. I honestly could have had just that for breakfast. But it was served with a side a local Ohio maple syrup and butter. I didn't realize maple syrup in Ohio is such a big thing. Apparently you can go on tours of local maple farms and see how the syrup goes from tree to table. The syrup was also sweet without being too sweet and was a nice compliment to that perfect bite of everything. 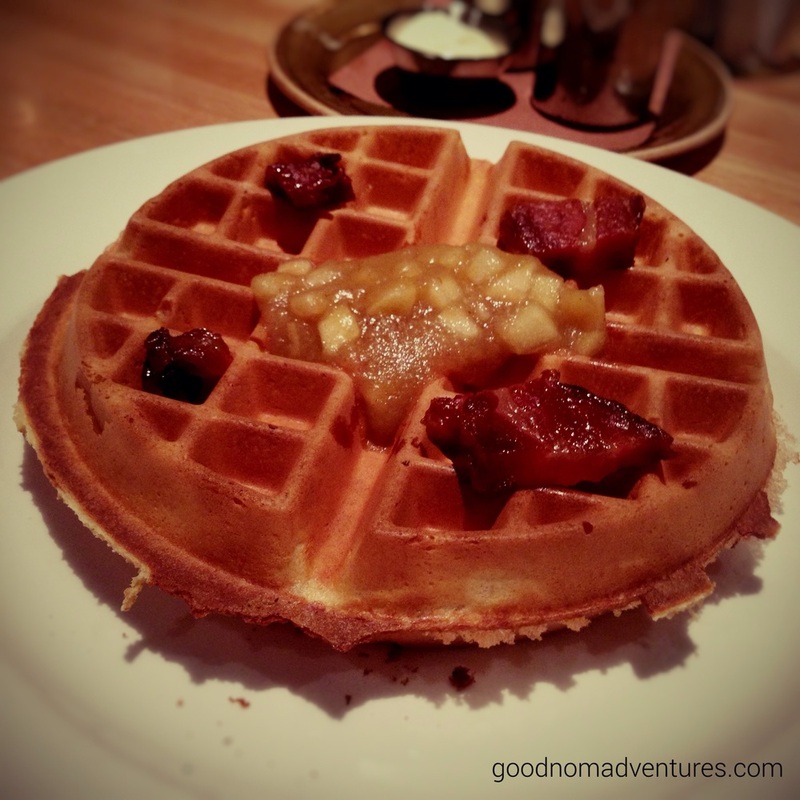 Urban Farmer is the place to go for a simple and delicious breakfast. I do want to go back and actually try a steak, which is hear is amazing. I've also hear that sometimes you may be able to find a spot at the bar even if the place is sold out. I recommend making reservations as soon as you know you want to this try place...and I know you do.